We touched down in the scorching heat on our comfy Cathay Pacific flight from Hong Kong. I don’t think I’d ever been so hot in my life. Not in the the middle of a desert in the driest place on earth. Not inside a broken elevator with stagnant heat similar to that of Hell. Not even listening to the new Drake album in the dead of summer. It was more like Nelly hot, take-off-all-your-clothes hot, in the club so hot somebody better pull the fire sprinkler system as seen in the ‘Hot In Here’ music video. Anywho, I digress. Bangkok is hot. I realized that much just from the jet bridge. By the time I made it to the hotel, a shower was my on my list. Then exploring. Then showering. Then more exploring. It’s a vicious cycle while adventuring through the capital of Thailand in the middle of summer! Continuing outdoors, I spotted the pool which I desperately wanted to submerge myself into but work called, as did the Mandarin Oriental traditional shuttle boat for a jaunt across the river where the spa resided, which brings me to a funny story. Hannah (the #BucketListWithLesley winner) and I were unknowingly booked for a couple’s massage that day. Seeing as how we’d just met and how this would be Hannah’s first massage, we were a bit hesitant on proceeding. If you follow me on snapchat, you probably already know that we went through with the appointment because by that time, we were already best travel buddies. I don’t think I’ve ever laughed so hard as we ate our refreshments of sticky rice and ginger tea. Our room looked out over the boat-filled Chao Phraya River with dotted temples in the distance. I couldn’t wait to get out there, even if the Weather Channel app read 102 degrees. All in all, I highly recommend the Mandarin Oriental for its innovative restaurants, friendly and beyond helpful staff, ornate interiors and location, location, location. If I can advise you on any menu item while in Bangkok, it would be to eat copious amounts of Pad Thai. With chicken or shrimp or tofu or whatever additions you desire. I’m going to have to end this discussion prematurely before I drive to the nearest Thai restaurant and go HAM at 3pm in the afternoon. There are far more dishes to try that pay homage to the intense mix of spicy, sour, sweet and salty flavors. Spicy soups, chiles, rice and coconut milk crowd every menu as well. Try them ALL. It may be fancy and it may be pricey, but after visiting Breeze Restaurant for dinner one evening, I’d recommend it to anyone. Set above Bangkok on Lebua Hotel’s 51st floor, Breeze is nothing short of beautiful while dining with a view and a WOW factor. The glass walkway will transport you inside the video game of Mario Kart’s Rainbow Road. Sure, Bangkok is hot, polluted, and busy, but to say it’s not vibrant is a lie. After dinner, don’t miss getting a night cap at Sky Bar on the 63rd floor of the same State Tower as the Lebua Hotel. You’ll most likely notice that you’ve seen it somewhere before…which would be on the big screen during The Hangover II. Gotta love a good rooftop! There’s something about this hectic mess of a city that I love, and that love comes from its contrasts. Buddhist temples share space with neon lit streets. Traffic sits at a standstill while long-tail boats are on the go. Street food is often overlooked by rooftop restaurants. I’ll take the good, the bad, the ugly and the in between, please. Damnoen Saduak has been Thailand’s best known floating market for a long time, but it’s also the most touristy one. Putting that fact aside, the market is vibrant and boasts boats full of locals selling colorful fruits. The raging heat turned my light blue romper into a dark blue romper that day, but the coconut ice cream made up for it. The market is only operated in the morning because the temps rise too high in the afternoon for anything to be enjoyable. It’s also 90km outside of the city, but the Mandarin Oriental made sure to set us up with the perfect small group to experience it. The Grand Palace always leaves visitors in awe of its beautiful architecture and intricate detail. Built in 1782, the 150-year home of the Thai King is now used for official events. 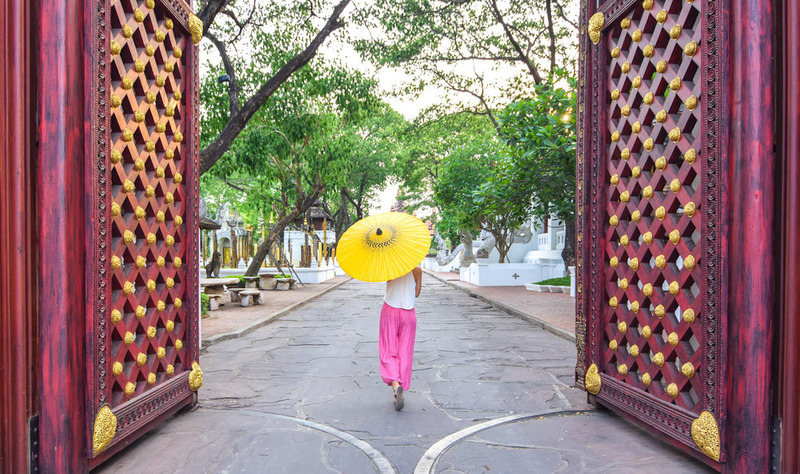 With more than 32,000 temples in Thailand and over 400 in Bangkok, temple time should most definitely be penciled in on the itinerary. The most popular are Wat Pra Kaew, Wat Arun and Wat Pho. The BTS (or Bangkok Mass Transportation System) will take you all over the city. My favorite activity consisted of taking a long-tail boat from the Mandarin Oriental at sunset to visit the Wat Arun Temple. Maybe it was being on the water and (somewhat) escaping the heat. Maybe it was the vivid colors of the sunset. Maybe it was the temple itself. I highly recommend this activity with a drink in hand. Muay Thai boxing is always an option if you’re in for a crazy workout. Master Toddy’s is apparently where the sweat goes down. Visit Asiatique, an open-air night bazaar on the riverfront that is easily accessible from the Mandarin Oriental. My best advice: bargain everything! Over to YOU! Ever been to Bangkok? It’s a huge place. Leave all suggestions and recs below! Bangkok is definitely hot. It was the first stop on our round the world trip that started in September last year, and wow, what a shock, coming from rainy Belgium! I loved the Chatuchak Weekend Market (I love markets), with its lime juices, coconut ice creams and endless stalls of things you don’t need, but want so bad. 🙂 My favourite Thai food? A good yellow curry. What time of year did you go to Thailand that it was so hot? Also….total American question: how likely is it to have air conditioning in the hotels, restaurants, etc. ?